I will tell you a tale of two worlds for Ontario chicken. Small Flock Poultry Farmers ("Small Flockers") believe in openness and accountability. CFO wants to protect the un-knowable secrets surrounding factory chickens. Small Flockers want to provide full disclosure, provided in writing to each and every customer. CFO is afraid of consumers learning about the Frankenstein drug injections into fertilized eggs that will eventually hatch, grow, and become your Sunday roast chicken dinner. Small Flockers believe that injecting drugs and chemicals into fertilized eggs is an abomination, isn't necessary, is a tell-tale sign of major problem in CFO's systems, and shouldn't be permitted. CFO wants you to keep buying their imitation chicken products, so they won't tell you about the drugs and chemical fed to the chickens they want you to buy and eat. Small Flockers believe that proper housing and care for their poultry will minimize or eliminate the need for all or most drugs and chemicals in the poultry feed. If the birds become ill, they will be treated using known, approved, and safe animal husbandry methods, or euthanized. CFO whispers behind close doors about the strange and questionable occurrences during the short 56 day life of the factory chicken you will soon eat (from day-old chick to neck-meets-knife at the slaughter plant). Small Flockers want to protect their birds from predators (eg. foxes, coyotes, etc. ), then provide them a low-stress, high quality life in a clean, healthy environment that is as close to natural conditions as can occur. CFO is pie-eyed and embarrassed when they see what happens to their live birds at the slaughter plant and beyond. Small Flockers want to control the entire process, from day-old chicks to finished meat in the refrigerator, ready for sale. If there is a problem, the customers knows who is responsible. Small Flockers has drafted a Chicken Full Disclosure Form and submitted it to OMAF (Ontario Ministry of Agriculture and Food) for their review and approval. This form provides full disclosure to customers buying chicken meat at the farm gate. This form is filled out based on my farm, so other Small Flockers may show different results. With this form, customers know everything about the meat they are considering for purchase. It covers the parent rooster & hen who laid the eggs, the hatching of those eggs, and the entire life of the chicken, from chick to a full-sized adult chicken, as well as the details about when and how the bird was slaughtered. The above square of "random" black and white squares is called a QR code, the latest thing for smart phones to quickly get info on something. 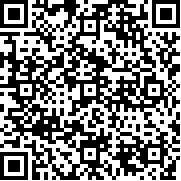 Take a picture of this QR code with a smart phone, and your phone can decode whatever it says. In this case, it leads to the same link as the Chicken Full Disclosure Form above, which is the same as the following hyperlink on the Internet. This QR code could follow the chicken everywhere it goes, from factory farm to meat display case at your friendly neighbourhood grocery store. The labels can be stuck onto every package of chicken at the slaughter plant, or scanned off the bulk container, then printed on the store's custom label. If you see that label on a chicken for sale, you can scan the QR code and know EVERYTHING about that chicken, before you buy. If you don't like what you read on the total disclosure for that chicken, you can pass it by. Perhaps one day, the grocery store will have a terminal by the meat counter where consumers can access a computer database that has all the products in that store. You can search for the various features you seek, for example: non_GMO, non-organic, processed by anybody except that infamous slaughter plant that you saw in the news last night as having another food recall AGAIN! The terminal shows you 3 selections available that meet your criteria, 2 fresh, 1 frozen. You choose the frozen, and it shows you there are 23 of those items still in stock at Aisle 7, Casement 4B, and a map showing where to walk in the store to pick up your prize selection. That is power for the consumer. Small Flockers think CFO should consider that possible solution. That's why CFO sees Small Flockers as very dangerous and scary, for Small Flockers want to empower the consumer. CFO wants to keep consumers as un-educated chicken slaves. That's why this will never happen until the consumers rise up and force the government to force CFO to follow new rules, a new philosophy for food. It's that simple. The choice is yours, consumers.